A lawsuit, an official’s resignation, and failed legislative proposals marked the beginning of June. 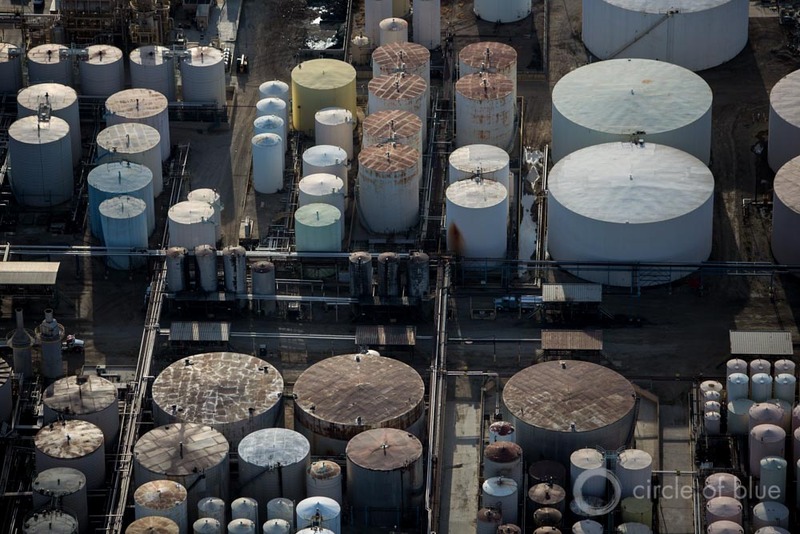 Tanks that hold processing water dot the landscape in Kern County’s oil fields. What to do with the billions of gallons of wastewater that the industry produces has become a paramount question during California’s drought emergency. Click image to enlarge. Problems with the oil industry’s disposal of billions of gallons of briny wastewater and the state’s botched permitting process continue to ripple through California, from the industry’s hub in Kern County to the state capital and now to the courtroom. A lawsuit filed on June 3 in the U.S. District Court for the Central District of California alleges that Governor Jerry Brown (D) conspired in 2011 with oil companies operating in the San Joaquin Valley, in Kern County, to oust the state’s oil regulator and replace her with an official who would be more lenient in approving wastewater-disposal permits. California’s oil industry — the nation’s third largest — produces more water than oil. For every barrel of oil that is pumped out of the ground, roughly 15 barrels of salty, chemical-laden water travel up the borehole. Most of the water is reinjected underground — some into the oil reserves — to maintain pressure in the field, and a lesser quantity is reinjected into aquifers that are supposed to be too salty or deep to be useful for drinking water. In the last few years, however, a U.S. Environmental Protection Agency investigation revealed that protected aquifers were being used as waste dumps. The state shut down 23 injection wells last year and is requiring that 452 more wells acquire proper permits in the next 20 months or be closed, as well. The lawsuit alleges more than negligence. Called a RICO lawsuit, the case alleges collusion between state officials and two of the largest oil companies, Chevron and Occidental. The lawsuit is brought by a group of Kern County farmers who claim that salty oilfield wastewater poisoned one of the plaintiff’s cherry orchards. After Elena Miller — former oil regulator at the Division of Oil, Gas, and Geothermal Resources (DOGGR) — was fired in November 2011, the rate of approvals for new injection wells soared under the new appointee, from the typical 50 permits a year to 1,575 permits in 2012 alone, the lawsuit claims. In his one paragraph resignation letter, Nechodom thanked his staff and the governor for the opportunity to serve. The California Natural Resources Agency — the umbrella agency that includes the Department of Conservation — offered to Circle of Blue no additional comment beyond the content of Nechodom’s letter. “I have nothing to add; a resignation is a personnel issue,” wrote Nancy Vogel, agency spokeswoman, in an email to Circle of Blue. Meanwhile, in the state legislature, two bills that would have added extra layers of scrutiny and protection for the state’s aquifers were rejected by their respective chambers. SB 454, sponsored by Ben Allen (D) from Santa Monica, would have required DOGGR to consult with the State Water Resources Control Board before asking federal regulators to allow salty aquifers to be used as trash cans for oilfield waste. The bill also would have prohibited aquifers with total dissolved solids concentrations less than 3,000 parts per million (ppm) to be used for wastewater injection, with the rationale that these groundwater sources could be used for drinking water in the future with adequate treatment. Currently, these sorts of aquifers can receive an exemption to be used as waste dumps. The second rejected bill, AB 356, sponsored by Das Williams (D) from Santa Barbara County, took a bigger step. In addition to consultations with the State Water Board, AB 356 required more information about pollutants that are injected underground and more monitoring of groundwater in the vicinity of approved injection wells. The bill was modeled after a bill that was signed into law last year and required oil companies to disclose water and chemical data regarding fracking operations. Under AB 356, similar disclosures would have been required for the wastewater that companies inject underground. Companies would have to identify the pollutants in the wastewater and their concentrations. Each injection well would have needed a monitoring plan, and water-quality data would have needed to be reported at least twice annually. The only oil-wastewater bill to pass its house of origin is SB 248, introduced by Fran Pavley (D). The bill, now in the Assembly — which, like the Senate is majority Democrat — requires well operators to file monthly reports on the chemical composition of produced water. The bill requires the state to update its database systems and to develop new regulations for injection wells through a public and scientific review.